Early adopters frequently find little snags that are quickly patched, and this week is no different. I have taken delivery of the new Ninja Blade recorder last week. It’s an awesome piece of kit for the C100 user – but when I record 25PsF, I noticed that the images are shifted two pixels to the left with a black line running down the right hand edge. Atomos support are on the case have fixed it, they suggest we update to version 5.1.1 here. we keep the C100 set to 25PsF and set the Ninja Blade to 50i. 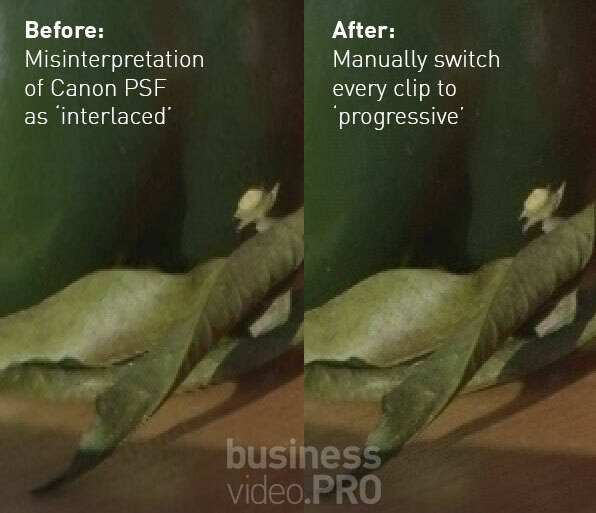 In FCPX and Premiere (I don’t use Avid) simply do the 2:2 pulldown trick by treating it like AVCHD footage, manually switching the files from interlaced to progressive as described in PSF – the fix. Combine all this with very low power consumption, a lightweight chassis and a wide range of media choices, it closes the gap between the C100 and C300. I’ll do an in-depth review when I’ve cleared my current workload, and I’ll go into a bit of depth over the shot logging facilities which will really make a difference to shooting interviews and long form events such as presentations and conferences. But not now. I really should be editing! Until then, remember the 50i to 25p trick. Well, it’s easy to deal with this little inconvenience in PAL-land. If you shoot in 24p or 23.976 PSF mode, you’ll find the same black line, so you’re recommended to shoot in 59.973 and you’re on your own. The C100’s AVCHD is a little odd – you may see ‘ghost interlace’ around strong colours in PsF video. 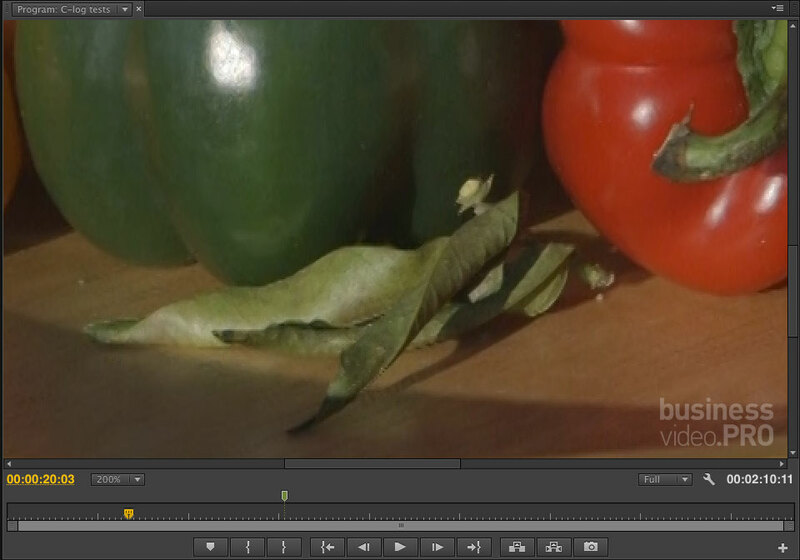 AVCHD is 4:2:0 – the resolution of the colour is a quarter of the resolution of the base image. Normally, our eyes aren’t so bothered about this, and most of the time nobody’s going to notice. However, stronger colours found in scenes common to event videographers, and when ‘amplifying’ colours during grading, all draw attention to this artifact. Note that this problem is completely separate from the ‘Malign PsF’ problem discussed in another post, but as the C100 is the only camera that generates this particular problem in its internal recordings, I suspect that this is where the issue lies. I’ve never seen this in Panasonic or Sony implementations of AVCHD. This is a 200% frame of some strongly coloured (but natural) objects, note the peculiar pattern along the diagonals – not quite stair-stepped as you might imagine. 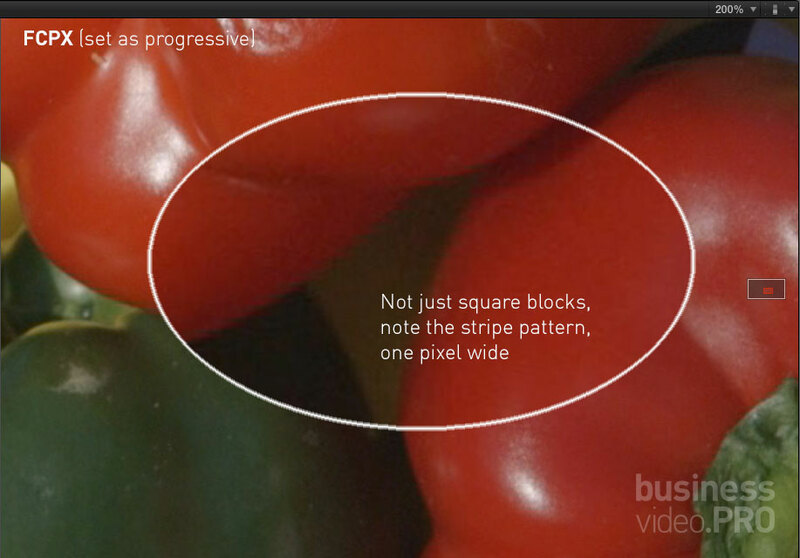 There are stripes at the edge of the red peppers, and their length denotes interframe movement. These artefacts illustrate that there’s some interlace going on even though the image is progressive. Like ‘true’ interlacing artefacts, these stripey areas add extra ‘junk information’ which must be encoded and compressed when delivering video in web ready formats. 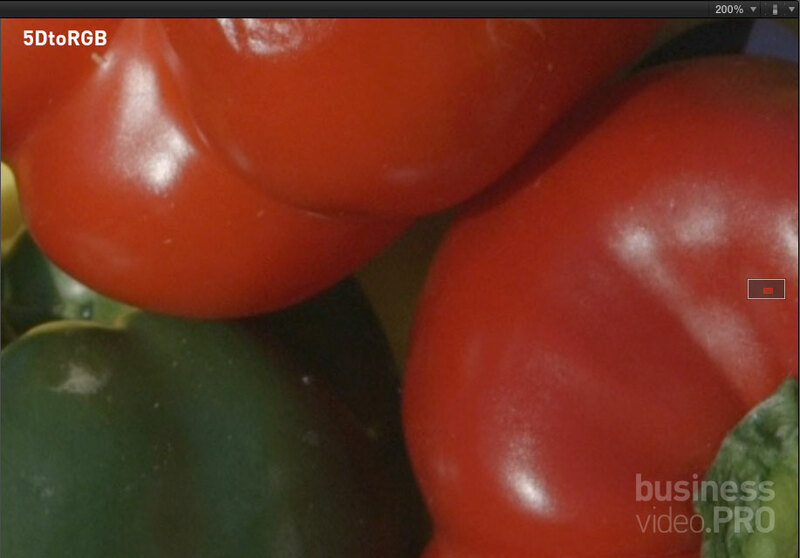 These are wasting bitrate and robbing the image of crispness and detail. Reds are most affected, but these issues crop up in areas of strong chrominance including fabrics, graphics and stage/theatrical lighting. So the only benefit would be to older computers that don’t like handling AVCHD in its natural state. To isolate the problem to the recording format rather than the camera, I also shot this scene on an external recorder using the Canon’s 4:2:2 HDMI output and in recorded in ProRes 422HQ. The colour information is far better, but note the extra noise in the image (the C100 includes noise reduction for its AVCHD recordings to help the efficiency of its encoding). This is the kind of image one might expect from the Canon C300 which records 4:2:2 in-camera at 50 Mbits per second. 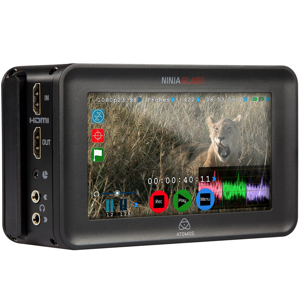 Adding an external recorder such as the Atomos Ninja matches the C300’s quality. But let’s say you don’t have the option to use an external recorder – can the internal recordings be fixed? The results are a very acceptable midway point between the blocky (stripey) AVCHD and the better colour resolution of the ProResHQ. Here are the settings I use – I’ll do a separate guide to 5DtoRGB in a separate post. The only key change is a switch from BT.601 to BT.709 (the former is for US Standard Definition, the latter is for all HD material, a new standard is available for 4K). 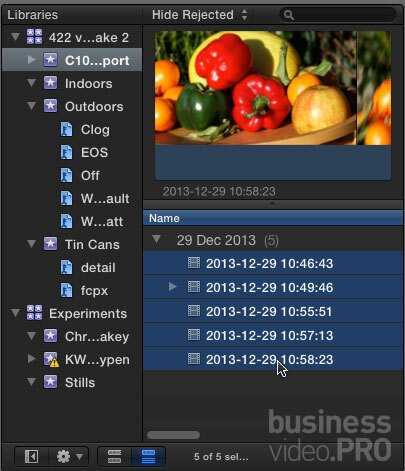 So why should you NOT process all your C100 rushes through 5DtoRGB? It takes time. Processing a 37 second clip took 159 seconds (2 mins 39 seconds) on my i7 2.3 GHz MacBook Pro. Compare that with 83 seconds for ClipWrap to transcode, and only 6 seconds to rewrap (similar to Final Cut Pro’s import). You will have to judge whether the benefits of shooting internally with the significant transcode time outweigh the cost of an external recorder and the inconvenience of using it. You may wish to follow my pattern for the majority of my non-chromakey, fast turnaround work, where I’ll shoot internally, and only when I encounter difficult situations, opt to transcode those files via 5DtoRGB. This is not a panacea. Denoising is even more processor intensive – taking a long time to render. My early testing shows that you can under- and over-do it with unpleasant results, and that the finished result – assuming that you’re not correcting a fault, but preparing for a grade – doesn’t compress quite as well. It’s too slick, and therefore perversely needs some film grain on top. But that’s another post. 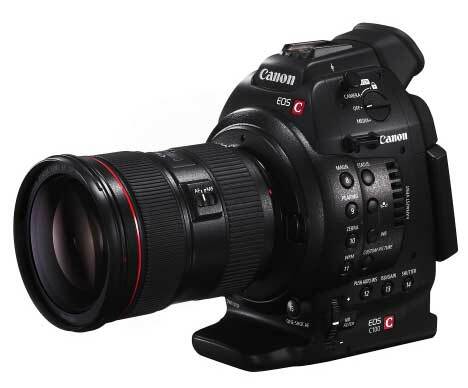 The Canon C100 produces a very nice, very detailed image just like its bigger brother, the C300. However, the C100 uses AVCHD as its internal codec and Canon have chosen (yet again) a slightly odd version of this standard that creates problems in Non Linear Edit software such as Premiere Pro and Final Cut Pro X (excellent article by Allan Tépper, ProVideo Coalition). Unless you perform a couple of extra steps, you may notice that the images have aliasing artifacts – stair steps on edges and around areas of detail. 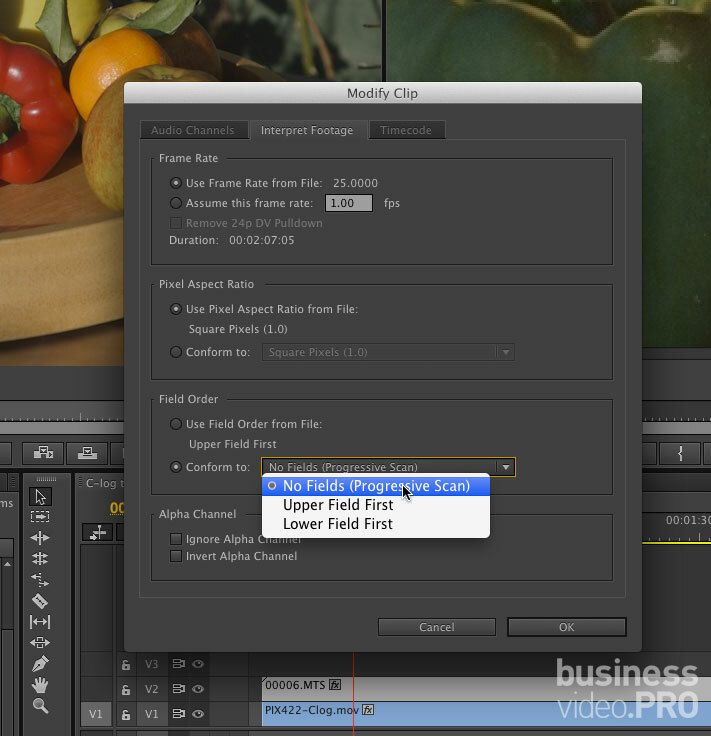 Here’s an example of the problem from within Adobe Premiere Pro, set to view the C100’s AVCHD footage at 200%. 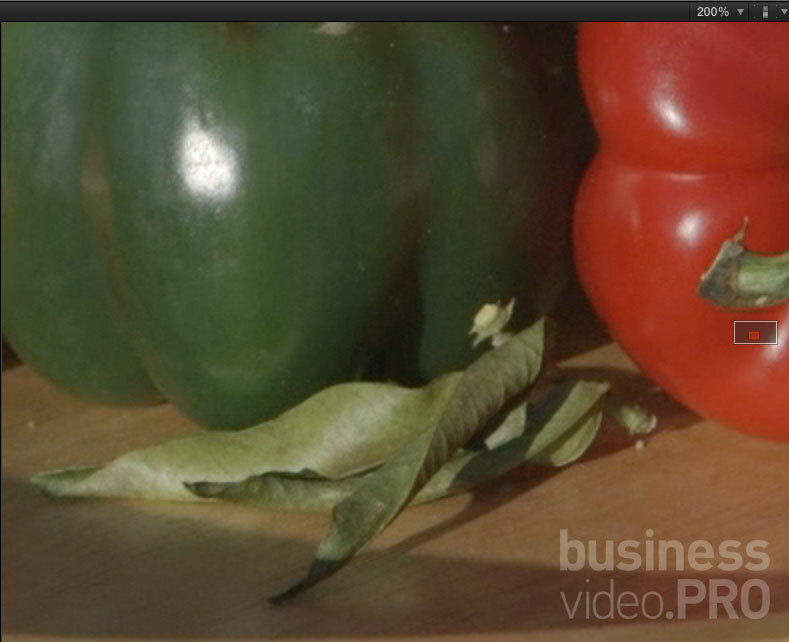 Note the aliasing around the leaves in the centre of the picture (click it to see a 1:1 view). Premiere has interpreted the progressive video as interlaced, and is ‘deinterlacing it’ by removing alternate lines of pixels and then ‘papering over the cracks’. It’s not very pretty. 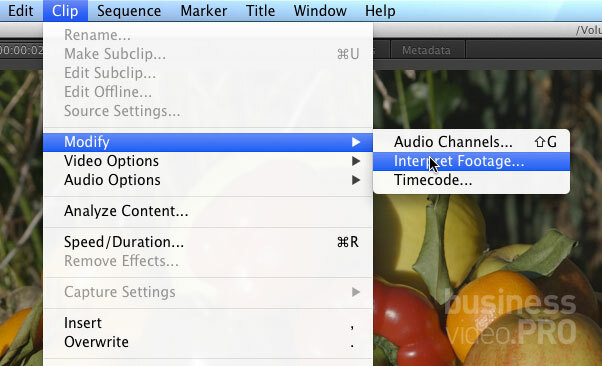 Alternatively, with your clips selected, choose ‘Interpret Footage…’ from the ‘Clip –> Modify’ menu. Now your clips will display correctly at their full resolution. The initial situation looks much worse in FCPX, which seems to have a bit of an issue with C100 footage, even after the recent update to version 10.1. The key to the FCPX fix is to let FCPX completely finish importing AVCHD before you try to correct the interlace problem. 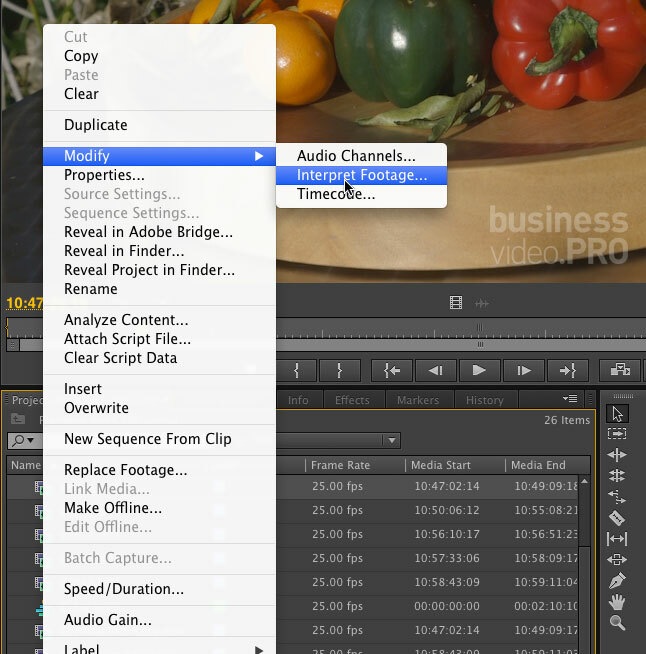 If you continue with these steps whilst the footage is still importing, changes will not ‘stick’ – clicking off the clips to select something else will show that nothing has really changed. Check that all background tasks have completed before progressing. First, select all your freshly imported C100 clips. Eagle-eyed readers may wonder why the preview icon is so bright and vivid whilst the example clips are tonaly calmer. The five clips use different Custom Picture profiles. Bring up the Inspector if hidden (Command-4), and select the Info tab. 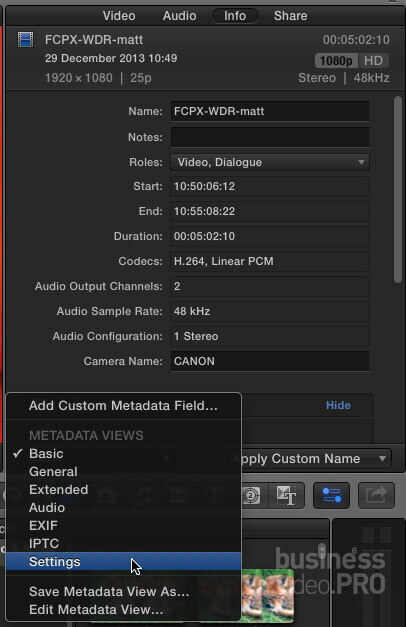 In the bottom left of the Inspector, there’s a pop-up to show different Metadata views. Select Settings. 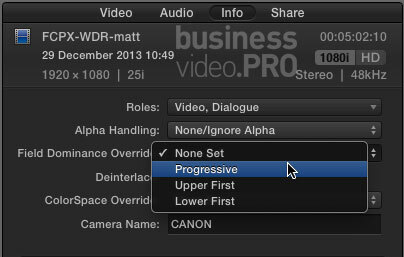 In the Settings view of the Info pane, you’ll find the snappily titled ‘Field Dominance Override’, where you can force FCPX to interpret footage as Progressive – which is what we want. Setting it as Upper First will cater for almost all interlaced footage except DV, which is Lower First. Setting it back to ‘None’ lets FCPX decide. We want ‘Progressive’. Now the video displays correctly.